The Federal Reserve seems to have won its war against interest rates at the expense of investor returns. If you are saving for retirement in relatively safe corporate bonds, you’re lucky to be breaking even after inflation. Stocks have done well over the last five years but you’ll be lucky to see the 7% average annual return going forward, and that is if you can avoid the next market crash. 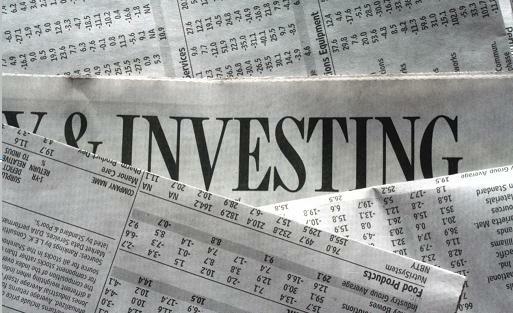 There are increasingly few investments these days that provide the necessary return for investors to meet their income goals in retirement. Enter Peer Lending, the intersection of the online social world and traditional lending. This revolutionary new form of finance is changing the way we think about loans in America and providing investors with very attractive returns. The idea of peer lending could not be simpler. A borrower fills out an application for a loan of up to $35,000 on one of the two lending sites, either Prosper or Lending Club in the United States. After a review and credit check, the application is given a risk rating and assigned an interest rate. The loan then goes live on the website where people can decide to invest in a portion of the loan, from $25 on up. Once the loan receives enough investor money to meet the requested amount, the funds are deposited in the borrower’s bank account. The borrower makes regular payments to the lending site, just as with any loan, and the lending site passes the money on to investors. Investing in bank loans is nothing new. Investors have been doing it for ages, only that before they had to go through the bank or through brokerage firms. Peer lending is taking the middleman out of the equation and connecting borrowers and investors directly. Sounds risky, is it worth it? There are risks to peer lending. Many investors see potential returns of 20% and higher in the most risky loan categories and get images of sandy beaches and Mai Tai cocktails dancing in their head. They jump into as many risky loans as they can get but quickly sour when loans start defaulting. There is a reason why loans in the riskiest categories offer such high returns. It is because there are more of them that will eventually default. Even after defaulting loans, returns to peer lending are very good compared to other investments. 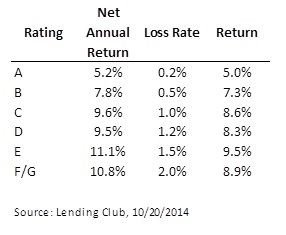 The table below shows average returns across rating groups for loans on Lending Club through October 20th of this year. You can see that, even with the higher loss rate on the most risky loans, most loan categories offer a return between 7% and 10% over the entire history of the site. Over the two years to July 2014, the average return was 9.3% for all loans originated on Lending Club. The great thing about investing in peer loans, as opposed to the stock market or other investments, is that you can actually beat the performance of the average investor if you follow a strategy of loan picking. For the criteria I list below, you would have made a return of 12.2% annually over the last two years. That is nearly 3% higher than the return across all loans. According to a survey by Fidelity, the average investment account balance is $397,400 for people between the ages of 65 and 69 years old. For this size account balance, you would need just 20% of your account in peer loans ($82,000) to produce a $10,000 income from a 12.2% annual return. This might not be quite enough to retire on but it would be a great start along with the return on the other $315,400 in your account. I actually recently interviewed an investor for my blog that has averaged a return of 14% annually over the last five years on his Prosper account. Jeff had some great tips to share and I am in the process of incorporating some of them to see if they can consistently produce higher returns. I will let you know what I find out but in the mean time, I’ll share my own loan-picking criteria below. So tell me, why do you want this loan? I like to focus on loans for credit card repayment, debt consolidation and home improvement. There are a couple of reasons for this and why the return tends to be better. First, loans for debt consolidation and credit card repayment tend to be from lower credit score borrowers. They have built up a mountain of debt and need to start digging themselves out. They are happy to take out a 15% peer loan if it means they can pay off their 20% rate on other credit. Home improvement loans tend to work well also. I am not completely sure why but can only imagine that the borrower has a proud interest in the loan. It has helped them create real equity in their house and helped them build a home. I’ve taken out a home improvement loan before and I was more than grateful to my lender for the opportunity. Even at higher interest rates, home improvement borrowers pay their bills. If you can handle a higher default rate then categories D and E provide for a good balance between risk and reward. Over the last two years, losses in the two groups have averaged between 7.3% and 9.1% but average returns have been high as well. While returns can also be very good in the two highest-risk categories, I usually try to avoid them except in rare circumstances when I find a really good loan. Often the average return in the two riskiest categories will be lower than that of Category D or E because of higher defaults. The last screen I look for in loans is that the borrower has zero inquiries in the last six months. This one is probably not quite as important as others but helps to know that the borrower is not frantically looking for more ways to borrow money. Lately, because of the huge momentum in peer lending and the inflow of investors, it has been harder to find loans that clear the criteria. In this scenario, I would consider dropping the zero inquiries requirement but only relaxing it to maybe one or two inquiries. Rather than relax your criteria too much, you might just consider not investing as much. Jumping at any loan available is a good way to see your default rate rise and your return evaporate. These are just a few of the criteria you can use to pick loans on the peer lending platforms. By doing a little homework, you can beat the performance of the average investor in peer loans and turn a relatively small investment into a five-figure income. I would recommend starting small and developing a strategy with which you feel comfortable, then email me. I would love to hear your story. Is participation still blocked in certain states? I remember looking into doing this once and Ohio residents were not allowed. I thought that was rediculous and wrote off the whole concept. don’t write it off, if for any reason you move to another state then you can start. Unfortunately, Ohio is one of the states that does prohibit peer loan investing. I feel ya, my home state of Iowa is another. There are 23 states that prohibit investing on Prosper and 12 states that prohibit investing on Lending Club. All but five of the 12 states allow investing through a folioFn account in Lending Club loans. 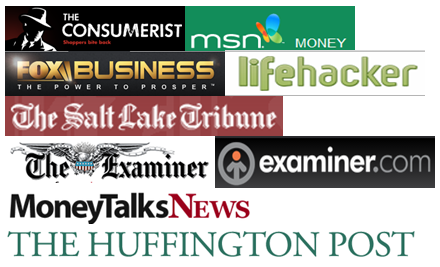 (a full list of the states and a review of the two lending platforms is available on my blog). For borrowers, three states prohibit borrowing on Prosper and five prohibit borrowing on Lending Club. I don’t think it will be too long before states open up to the peer platforms. Especially after the Lending Club IPO makes it more mainstream. A little ridiculous that you can borrow from nearly every state but investors still face big limitations. Is it worth looking into having a family member in another state start an account with money that I gave them? Or would that be more trouble than it’s worth? Opening an account under a family member’s name would be a possibility but likely more trouble than it’s worth. You’re probably looking at an additional 4% or so against other investments so maybe not enough for the hassle. I would expect investing to open up in more states soon. I could see this being a very valuable investment opportunity especially if you know that you can beat the rate of interest on your loan in an investment. I was considering taking out a loan with Kabbage because they offer very low interest rates for individuals with great credit and I know that I can most likely make more money than I would pay in interest. Not sure if it would be such a great investment if you are borrowing in peer loans at the same time. I guess it depends on what your credit score is and the rate you can get on loans. Rates are as low as 6% for the best rated borrowers to it could offer a decent spread. If you are looking for sources of funds to invest, secured loans on real estate are much lower. Borrowing against real estate at 4% could make sense if you can invest it in peer loans at 9% or higher. I’ve always been interested in lending on sites like Prosper, but have never pulled the trigger. Perhaps once I start my real estate investing I will take another look. This way I can diversify my investments even further. Thanks for the write-up! Peer loans can add great diversification to an investment portfolio. I’ve got an article coming up this week that shows correlation with stocks and bonds is basically nil. Beyond good diversification, it’s fairly consistent monthly income at a high rate, something that can’t be said for most income investments (other than real estate). Yes, you are right!! Peer loans can put in immense diversification to an asset group. Also visit Alphatrends that will teach you how to profit in the market regardless of its conditions. Become an expert stock trader today!